Combine powdered sugar, peanut butter and butter in a large bowl. Beat with an electric mixer on medium until smooth. Add cereal and gently stir until thoroughly combined. In a microwave-safe bowl, melt chocolate on HIGH for 2 minutes. Melt in 30-second increments, stirring after each one, until completely melted. Roll peanut butter mixture into 1-inch balls. 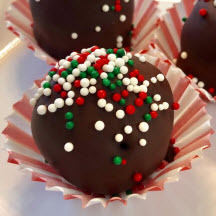 Using a fork or skewer, dip each ball in chocolate until completely covered. Gently shake off excess. Place peanut butter balls on a cookie sheet covered with wax paper until chocolate is firm. Refrigerate if kitchen is warm. Store in a tightly sealed container at room temperature. Makes 5 to 6 dozen peanut butter balls.